We are currently taking applications for a Recruitment Consultant Student Placement in London. Frank Recruitment Group is a global recruitment firm specialising in niche technology that powers the back-end of businesses. Our nine recruitment brands have experienced a huge demand for our professional services, and we are constantly bringing in new staff to help us meet that demand. We are now offering a 12-month placement for existing undergraduate university students who are looking for a placement in the recruitment industry. The program will begin with three months as a candidate-sourcing consultant, with the opportunity to progress to a 360-consultant role after 12 weeks in the role. This 12-month placement is a fixed-term contract and is designed to give you significant exposure to a career in sales, as well providing you with insight into how multiple support teams function within a large international organisation. Top-performing placement students will also have the opportunity to extend the placement to part-time work during their final year at university as well as graduate employment following completion of studies. Successful applicants will receive full training in our award-winning Frank University. Here you will receive seminar-style tutoring and on-the-job guidance in many valuable and transferable skills. You will also be assigned a personal development plan so you can track your own development in the business. To be eligible to apply for the Student Placement opportunity with Frank Recruitment Group, you must: i) have full legal authorisation to work on a full-time basis in the UK; ii) be registered as a full-time student at a UK university; iii) have completed at least two years of your undergraduate degree; iv) and be returning to study full-time upon completion of your placement with Frank Recruitment Group. You will be based at our London office, just 5 minutes from Tower Hill and Monument Underground stations. You can find us here: Centennium House, 3rd Floor, 100 Lower Thames Street, London, EC3R 6DL. 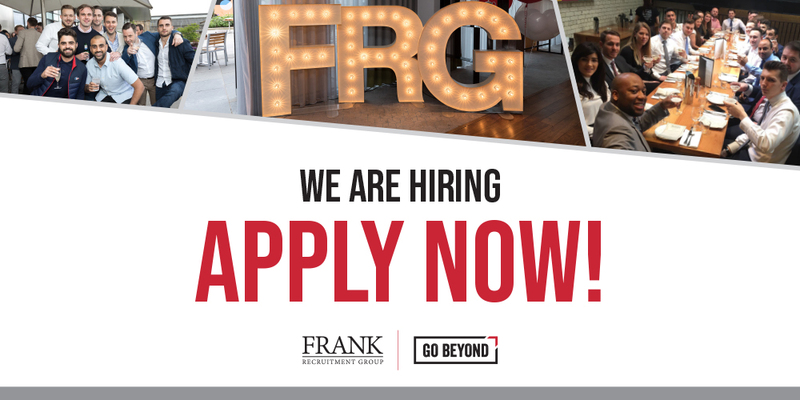 Apply now for a Recruitment Consultant Student Placement in London with Frank Recruitment Group.